It's time to take a turn for the practical and put together another complete CSS style sheet example. This example involves an XML document called news.xml that contains a news story marked up with XML code. Listing 10.6 contains the code for the News example document, which could feasibly be used by a newspaper or newsletter website to encode stories. Admittedly, the news story in this case may not qualify as front-page material, but it does reveal how the XML markup is used to add context to the content in the story. The goal of this example is to create a style sheet that displays the news story in a format similar to how you are accustomed to seeing printed stories in a newspaper. In other words, the title should appear in a large font followed by a much smaller byline and dateline and then the body of the story. The elements that factor into the style sheet are headline, byline, dateline, p, url, and quote. You could easily use absolute positioning to carefully lay out each of the elements in this example document, but it is not necessary. Rather than go into the details of absolute positioning, it is simpler in this case to carefully align the elements with the text-align property so that they appear where you want them. Listing 10.7 contains the code for the news.css style sheet, which is used to style the News XML document for display. Although this style sheet is a bit larger than the Contacts style sheet you saw earlier in the lesson, it is actually very straightforward if you study each of the style rules carefully. 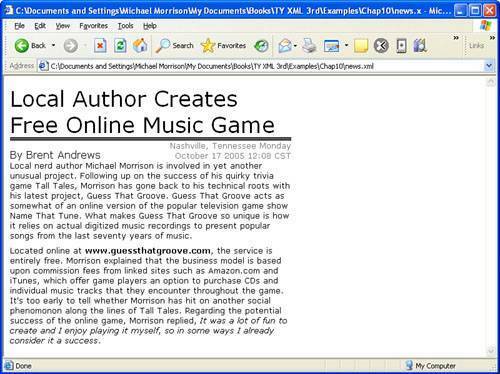 For example, the headline style rule has a width, bottom border, text color, and font, and it has its text aligned left (lines 19). The byline style rule is defined as an inline rule (line 21) and aligns text to the right (line 23). The p style rule sets a bottom margin in order to provide exact spacing between paragraphs (line 32). All of the style rules use different sized fonts except for url and quote, which inherit the font size of their parent style rule, which in this case is p. The resulting view of the News document using the news.css style sheet is shown in Figure 10.6. Figure 10.6. 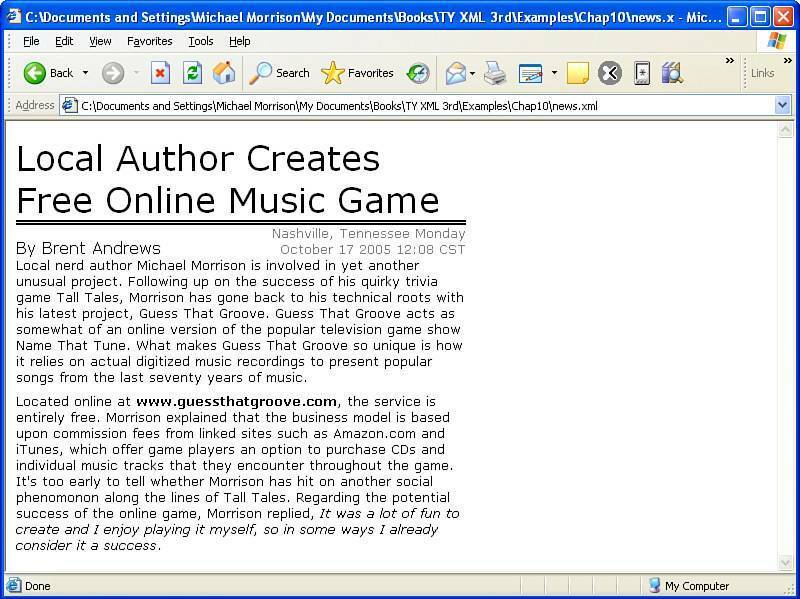 The News example document is displayed in Internet Explorer using the news.css style sheet. Notice in the figure how the style sheet takes the XML data and formats it into a layout resembling a story printed in a newspaper. Additionally, the URL and quote in the story are further styled so that they are called out in the text.